It turns out that our solar system is moving nearly 100,000 m.p.h. 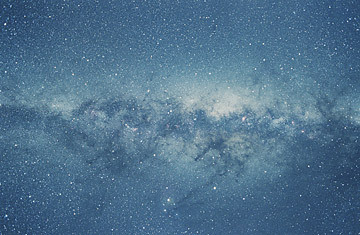 faster than previously thought  revolving around the center of the Milky Way at 568,000 m.p.h., announced Mark Reid of the Harvard-Smithsonian Center for Astrophysics on Monday at the American Astronomical Society's conference in Long Beach, Calif. Since velocity is related to mass, the 15% increase in solar-system speed translates into a near doubling of mass of the Milky Way, according to Reid's group  and all of that newfound bulk is composed of dark matter. Although it's our home galaxy, the Milky Way is not an easy entity to peg. Drawing a map of it has been likened to describing the town you're in when you've never ventured beyond the confines of your bedroom. In 1958, Jan Oort became the first to map the galaxy, by assessing the strength of neutral atomic hydrogen gas, a widespread component of the Milky Way. Pohl created his map using a kinetic model of the galaxy's gas flow, which was developed by Peter Engelmeier of the University of Zurich and Nicolai Bissantz of Ruhr University in Bochum, Germany, based on infrared data collected by a NASA satellite. Unlike visible light, infrared light penetrates dust clouds, so it provided Engelmeier and Bissantz with more precise measurements, in turn allowing Pohl to produce a more accurate, if not perfect, map. "Our method works over much of the Milky Way but not everywhere," he says. Pohl's map is the first to take into account the entirety of the Milky Way, including its elusive inner galaxy, which is "really complicated and weird," Pohl says, because of the gravitational pull of a large bar of matter located at the center; the map will be particularly useful to a research group in France that has been studying dark matter, which, as Reid's team has established, the Milky Way has a lot more of than previous studies had revealed. Dark matter, so called because it gives off little or no light, is one of the most abundant elements in the universe (it constitutes 23% of the universe's total density, whereas normal atoms make up only 4.6%), but because of its relatively recent discovery and our inability so far to gather direct evidence of its existence, it's also the least understood. With tools such as Pohl's map, scientists can achieve a better grasp of the mysterious matter. "The better we can understand [the structure of the galaxy], the better the chance for finding more evidence of dark matter," says Pohl.